After living in Pasadena for six months, it seemed about time Mike and I paid a visit to the Rose Bowl Flea Market. Operating for over forty five years, this Flea Market takes place on the second Sunday of every month, rain or shine. It’s one of the most popular markets in the world, a claim made true by the amount of traffic that can be seen leading into the area. Being our first visit, Mike and I weren’t sure what to expect from the market, but it didn’t take long to find out why so many people flock to this spot each month. Unless you plan to pay for an early admission and arrive before the general public, you can expect to park a bit of a distance from the entrance. I’d recommend wearing comfortable walking shoes and bringing along reusable bags if you want to make numerous purchases—it can be a hassle to carry around all of your items, as this is a big market and you’re in for a long day if you plan to see it all. The amount of vendors can be overwhelming, but you’re sure to find almost anything you need here: from food to clothes to furniture to all-natural beauty products. If you arrive in the morning, expect the vendors to haggle less over their prices. But don’t wait too long in the day to make a purchase, for the item you want could very well be gone by the time you’re ready. My advice? If you see something you really want, then buy it. 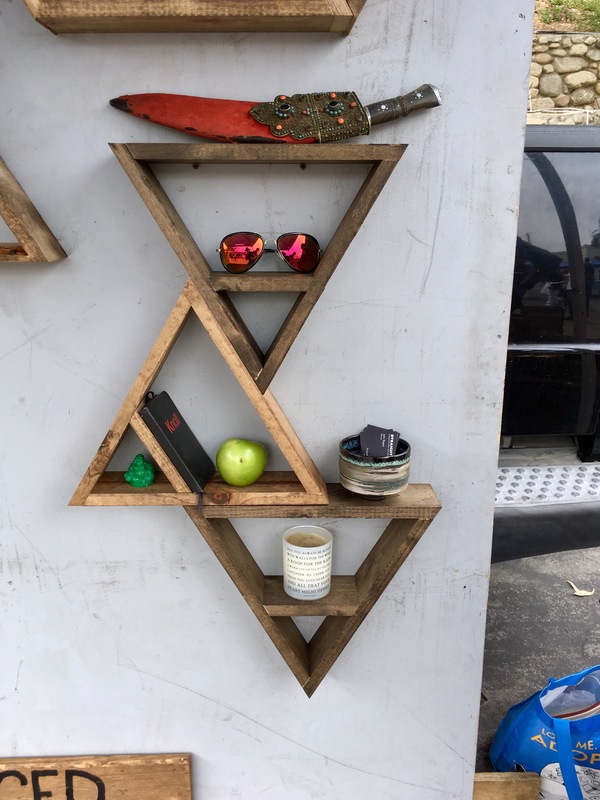 Last November I purchased a set of wooden shelves from Straight-Faced Wood Working at the Melrose Trading Post, and I have been wanting to buy more ever since. I was glad to see they had a booth set up at the Rose Bowl, and I added three more shelves to our collection—for only $30! Later in the day Mike and I came across a similar vendor selling wooden shelves for $15 a piece, so I’m glad we were able to score a better deal with Straight-Faced. While it’s good to buy an item you want when you see it, sometimes it’s wise to do a little shopping around first, in order to get the most bang for your buck. The other items on my list? A straw hat, Levi’s jean shorts, and vinyls to add to my growing collection. I wasn’t entirely sure if I would find what I was looking for, but I managed to reign success on all accounts. 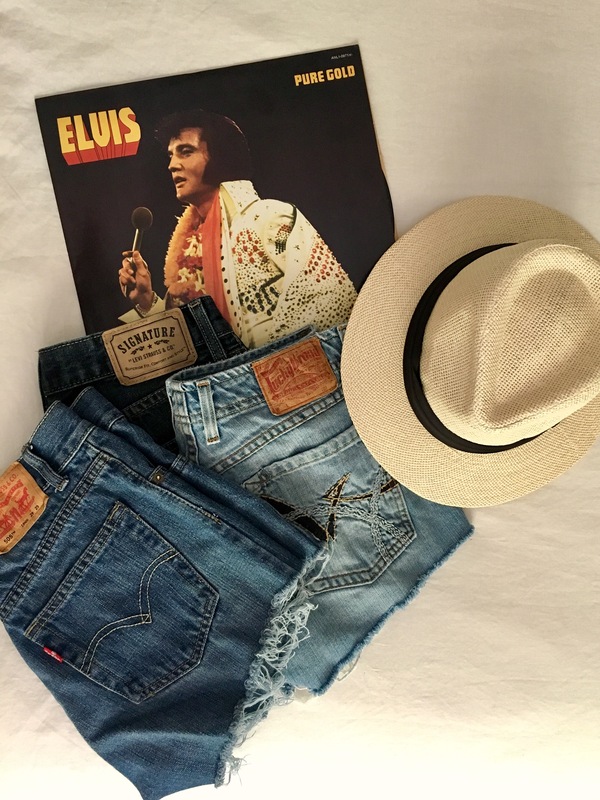 The straw hat I found for $10, the Levi’s and pair of Lucky Brand shorts sold for $5 each, and I got the Elvis vinyl for only $6. Score! My total for the day? Sixty-one dollars! I’d call our first trip to the Rose Bowl Flea Market a success (Mike wouldn’t, as he’d rather I didn’t buy anything. Oops 😛 ). And while we managed to spend more money on food than we would have liked, we still had a great first experience. I can’t wait to attend the market again and I highly recommend that everyone else attend too, given the opportunity to go. You never know what treasures you may find!